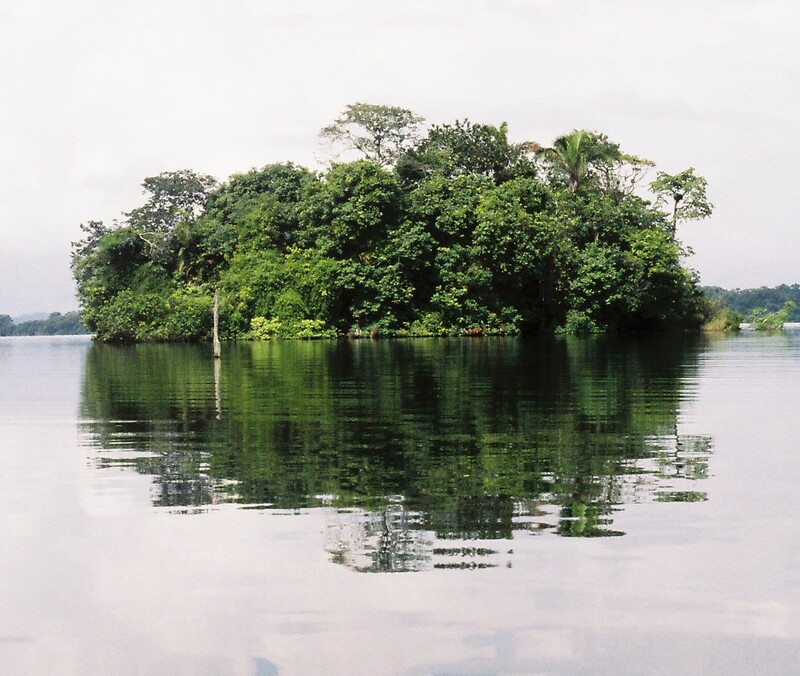 Many features referred to as islands are actually portions of previously more widespread ecosystems—otherwise known as habitat fragments. Rather than a trivial technicality or a question of semantics, establishing the historic origin of a habitat patch is crucial to formulating expectations of the ecological patterns represented, and was the basis of an article in the Journal of Biogeography pdf. Strictly speaking, islands are habitat patches that were formed more recently than their surrounding habitat—relatively new features that are initially unoccupied, becoming colonised in a predictable fashion by a sequence of organisms. In contrast, fragments are patches defined by the imposition of a new or modified matrix, isolating the habitat and diminishing movement rates of organisms into and out of the habitat patch. 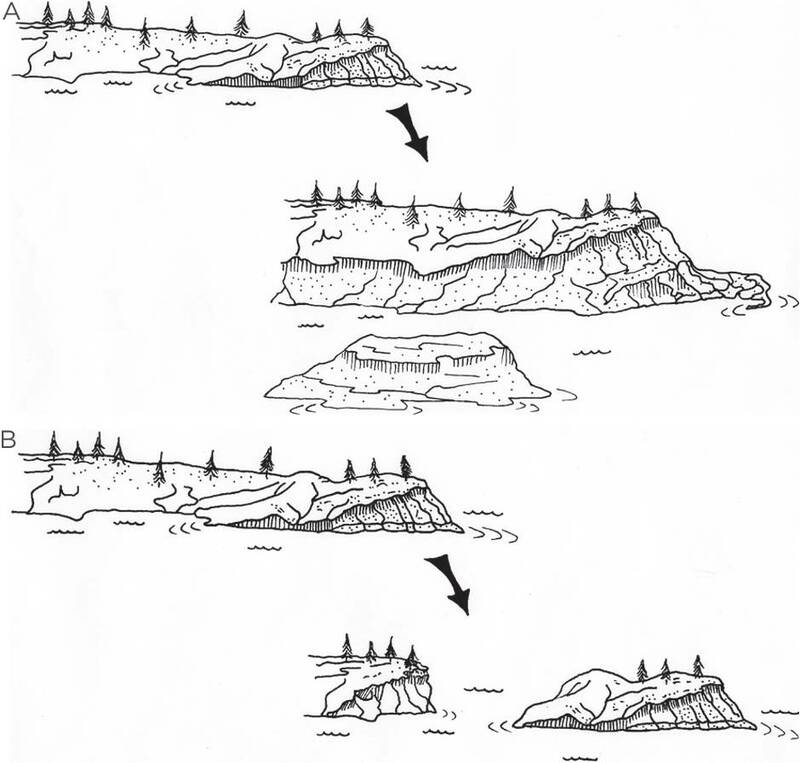 Schematic representation of the formation of a generic island de novo and by fragmentation. (A) In this example, lowering sea or lake levels expose a new habitat patch—a small island without any preexisting terrestrial biota. As with all islands, the biota gradually develops from two classes of organism: inter-patch dispersers coming from similar habitat elsewhere and matrix-derived species coming from the surrounding habitat. (B) Here, the fragment becomes isolated by subsidence, with the matrix habitat (in this case, water) surrounding the habitat patch. The fragment biota is initially dominated by relictual organisms (represented by trees in this example), with matrix-derived and inter-patch disperser taxa adding to the fragment biota. Illustration by Margaret J. Watson. Three features of this distinction are important. Firstly, note the complete lack of reference to water—islands and fragments may occur on land, in water: anywhere. Thus, a salt-lake can be considered an island, while an ox-bow lake qualifies as a fragment; most caves are islands, whereas icebergs are fragments. Secondly, there is no reference to temporal or spatial scale: Tasmania can be considered a fragment of the Australian continent isolated by rising sea-levels 10,000 years ago, just as a tidepool is a fragment lasting for less than a day. Finally, this functional distinction demonstrates that the key difference between islands and fragments lies in the sequence of events that defines them. For islands, the patch itself is the new feature, whereas for fragments, the habitat comprising the patch is pre-existing and patch boundaries are determined by the imposition of a new or modified matrix habitat. Spanning a wide range of ecosystems ranging in extent from centimetres to thousands of kilometres and existing for time periods from hours to millions of years, this distinction provides a useful framework to arrange our current understanding of how inherently patchy ecosystems function and to identify which factors best explain patterns of diversity and distribution within them. A functional classification of patchy landscapes. Despite being an intuitive distinction, many fragmented landscapes have traditionally been studied as archipelagos of islands and vice versa, leading to some inventive explanations for described patterns of occurrence. By re-arranging these studies into four groups—islands and fragments, old systems (>1000 years) and young landscapes (<100 years)—a surprising number of generalities emerge. These four classes can be further subdivided using a convenient third factor relating to the contrast between the patch (island or fragment) and the surrounding habitat or matrix. Phase differences (i.e., land-locked water bodies, patches of land surrounded by water) are deemed high contrast, whereas within-phase differences (e.g., a forest patch surrounded by grassland, rock outcrops within heathland) are low contrast. Using this three factor approach and some objective thresholds, most patchy landscapes can be readily assigned to one of eight classes. The first step in applying this classification is to establish whether or not a particular patch is an island or a fragment. While usually simple, it is not always straightforward and historic information may be equivocal or simply unavailable. Once the origin of the patch is established, patch age and matrix contrast determine which of eight classes it represents.This classification groups together a wide range of continental islands, often studied using divergent methods and typically not regarded as islands or patches. Using this approach, physically similar systems are revealed to be functionally divergent. Thus, inselbergs and caves—two classes of “continental island” that have received considerable attention from researchers—are true islands, whereas tepuis, mesas and most other montane patches are functionally fragments. One implication of this historic difference is manifested in the origin of organisms occurring within these patches, with an additional class of organism associated with habitat fragments. Known as relictual taxa, these are organisms that were living in the habitat prior to fragmentation, becoming isolated as the matrix surrounded the patch. While they need not be restricted to the fragment and may occasionally or regularly move to other patches, relictual taxa are typically lower vagility organisms, that either persist or become locally extinct post-fragmentation. Two other classes of organism occur on both islands and fragments, albeit in differing proportions. Matrix-derived taxa are those organisms originally associated with the matrix habitat, secondarily occupying the habitat patches. While this may be short-term or opportunistic (e.g., grassland birds nesting in forest fragments, or migrating raptors using inselbergs as staging areas) this becomes most evident over evolutionary time, as the organisms adapt to the new habitat. Examples of matrix-derived species include many cave-dwelling arthropods, exhibiting a suite of adaptations that confer advantages in the new habitat. The final class of organism—inter-patch disperser—are medium to high vagility taxa associated primarily with the patchy habitat, but can readily move between patches. Thus, swiftlets and rock-wallabies are inter-patch dispersers, dependent on specific habitat patches (caves and rocky massifs, respectively) but variously able to move between nearby patches across the intervening matrix. I discuss this in more detail in a chapter in the Encyclopedia of Islands pdf. One class of “continental islands” that has received disproportionate attention are montane remnants, and they serve as instructive examples to evaluate in more depth. Mountaintops often contain vegetation types and specific habitats that are altitudinally restricted, found only under specific climatic conditions associated with high elevations, including cloud forests, alpine grasslands, herbfields and paramo. Despite being poetically referred to as “sky islands” by some researchers, these vegetation types are often relictual fragments of previously more widespread habitats, isolated by changing climate. These habitat fragments are similar in many ways to the woodland and forest fragments isolated by agricultural development, but differ dramatically in their age. Most anthropogenically-created fragmented landscapes were formed by broad-scale clearing 150 to 80 years ago, as the regions of North America, Australasia, Latin America and South-east Asia were developed. Montane remnants worldwide were defined much earlier, as regional climates became warmer and drier—coinciding in most cases with the last inter-glacial period in the late Pleistocene. Hence, the fragments in many of these landscapes are 10,000 to 30,000 years old and, while subject to further and ongoing disturbance including additional clearing, these landscapes still retain the imprint of this initial shift. While most habitat change associated with anthropogenic activities (i.e., clearing, agricultural intensification, development) occurs over periods of years, vegetation change mediated by regional climatic shifts is often considered to take tens of thousands of years. Recent information, however, is dispelling this assumption. A growing body of research has examined changes in plant distributions associated with recent climate change, demonstrating that even subtle changes in mean temperature and rainfall can effect dramatic shifts in plant occurrence. These data are reinforced by studies of fluctuations in the northern extent of boreal forest during the Pleistocene, forest boundaries changing rapidly in response to drought associated with post-glacial warming. Hence, the creation of elevational remnants may have occurred far more rapidly than frequently assumed and many regions may have been transformed from continuous habitat to a mosaic of fragments within several thousand years or less. Compared with anthropogenically fragmented landscapes that have been the focus of several thousand separate ecological investigations, our understanding of these montane remnants is less advanced: determinants of diversity have been studied in less than fifty landscapes. Many studies of montane assemblages were conducted in response to MacArthur and Wilson’s equilibrium theory of island biogeography, ecologists keen to find out whether similar processes operated in these continental ecosystems. Having established presence/absence data for selected organismal groups, researchers then related these richness estimates to fragment area, distance to nearest continuous habitat patch (or “mainland”) and a range of other biogeographic metrics. Unlike anthropogenically-created fragments that are typically embedded within a developed matrix where access is straightforward, many montane remnants occur in remote and inaccessible regions. These logistical issues are compounded by a pronounced taxonomic impediment. 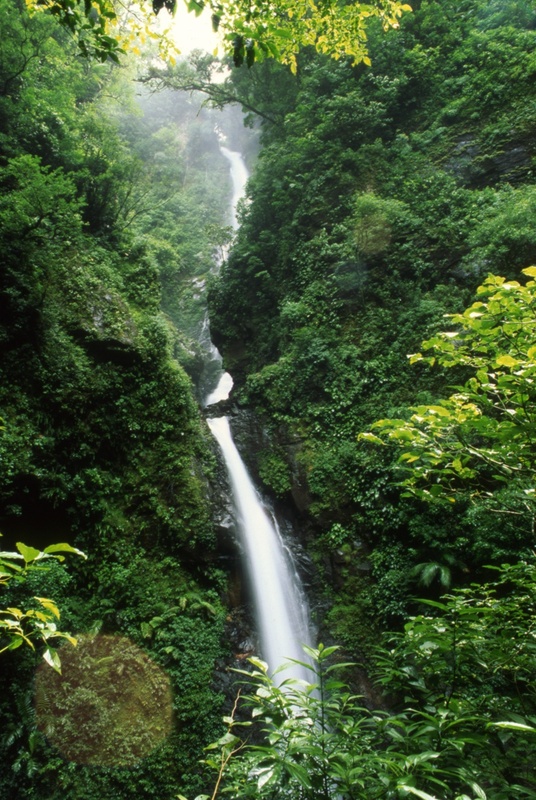 Far fewer researchers have visited many of these areas and, given the pronounced environmental heterogeneity in these mountainous landscapes, species often exhibit highly restricted distributions, with small-scale neo-endemics well represented. Thus, there are many undescribed or poorly known species, so working out the identities of the species present can pose very real challenges. Moreover, the repeated visits and thorough sampling required to generate accurate richness estimates are often not possible, reducing the accuracy of analyses and limiting a researcher’s ability to explain recorded patterns of occurrence. More information about my work on montane fragments is published in a two journals articles, one summarising my work in southern Mexico pdf, the other on cloud forests throughout Mesoamerica pdf.